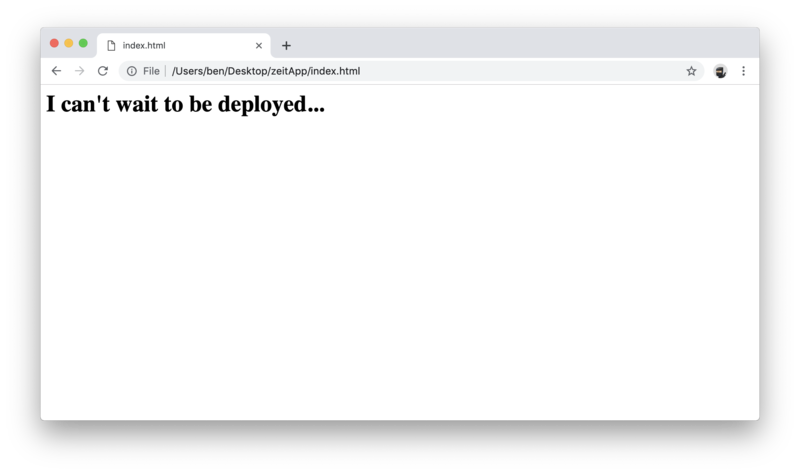 Deploy a website from scratch in minutes with Zeit Now. Note: I still have a lot to learn, so take what I write with a grain of salt. I want to share what I've learned with you because learning it genuinely brought me joy, and I want you to have some. To learn a simple, elegant deployment process for publishing web content that works for beginners and experienced developers 🤖. If you're not familiar with using the command line, this version of the tutorial might be confusing. If you'd rather learn the Desktop version of the tutorial, toggle the Beginner tutorial button above. All macs have the program Terminal installed by default. Open it, type ls, and press enter. You should see a list of files (kind of like a stripped down Finder) as the output. To get started with our new project, we'll need to change directory (folder) from our root to wherever you want your code to live. Use the command cd to enter an existing directory. Adding files to a directory is easy from the command line. Use the following command to create two files: index.html and now.json. Now.json is your config file for Zeit Now. Open index.html in your browser to make sure it worked. First, visit zeit.co and sign up (choosing "continue with email" is fastest). When prompted, make sure to install the Now CLI (Command Line Interface). This allows us to write commands to deploy our website from the command line. 🚨 We're one step from deployment! Just type the command now and your directory sampleProject will be deployed to a staging URL. If you're interested in learning more about the command line or just want the fastest possible path to deployment, toggle the Advanced tutorial radio button above. Start by creating a new folder somewhere on your computer where the code for your website will live. Create a second file named now.json. Insert the following code into the json file. To confirm that you're logged in and have the app running, check your navigation bar. Click on the Zeit triangle icon "▲". That's it! Our sample project has been deployed to the outputted link (now in your clipboard). Anyone on the internet can view that link. But why browse on Zeit? There are a lot of companies that will sell you a domain—GoDaddy, Namecheap, FreeDNS, Google Domains, etc.—so what makes one better than the next? Here's one reason: Some domain registrars leak your domain search history, which can result in your preferred domain being taken before you're ready to pay. 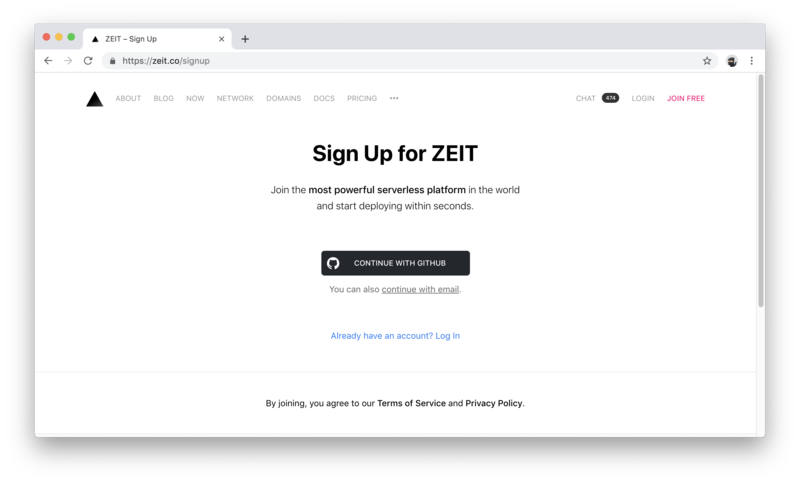 Note: If you already have your domain, check out Zeit's guide for migrating an existing domain to Zeit, and then return to Step 3 of this chapter. Once you've found your domain, return to the command line. It doesn't matter what directory (folder) you're in, as long as your now command works. Reminder: If you're unfamiliar with the command line, you can switch to the beginner version of this tutorial using the buttons at the top of the page. If you don't have a payment method attached to your Zeit account, you'll be prompted to enter payment info on the command line. Return to the command line and type now domains ls. You should see your domain name appear alongside some meta information like age and serviceType. cf stands for Cloudflare. You can toggle Cloudflare services for your Zeit domain from your dashboard. 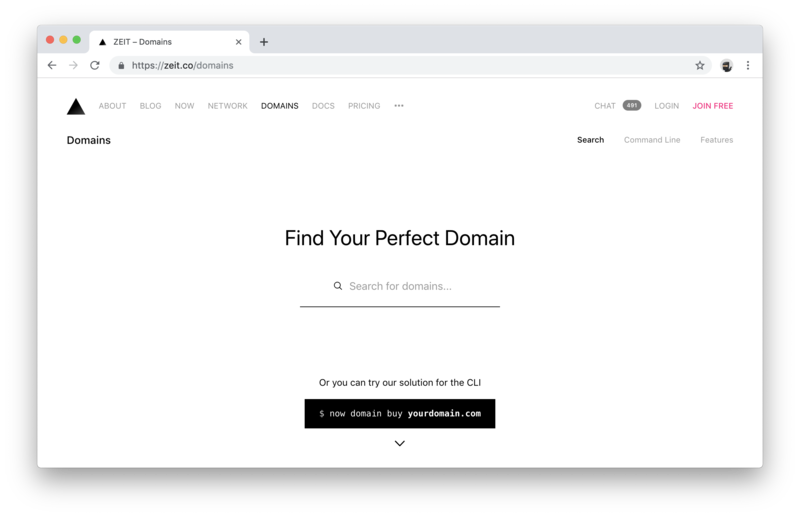 The last step to having a fully-functioning website is to connect, or alias, the content from Chapter 1 to your custom domain. Return to the command line. Make sure you're in the correct folder (ls), and type now alias followed by the long deployment domain from part one, and your custom domain (don't worry about prefixes like "https://" or "www" ... just type "yourdomain.com"). And that's it! Anytime you want to deploy your current codebase, just type now to get a new deployment URL. And to deploy and alias simultaneously, chain two commands. // Deploys once, then aliases that deployment URL to everything in the "alias" array. Once you've found your domain, click on it to buy. You might need to enter credit card information on Zeit if you haven't yet. After purchasing, navigate to your dashboard and click on the Domains section. You should see a list of all your domains there (likely just the one that you bought). The last step to having a fully-functioning website is to connect, or alias, the content from earlier in the tutorial. To alias a deployment, visit zeit.co/dashboard. You should see a list of your project(s). Click into the simple project (mine is called zeitApp) you deployed earlier and select the most recent deployment URL. Alias it with your custom domain, or some variant of your domain name (like blog.yourwebsite.com). Now, whenever you want to update your site, drag your folder into the Now app, check out the deployment URL to make sure everything looks right, and alias it from your dashboard.